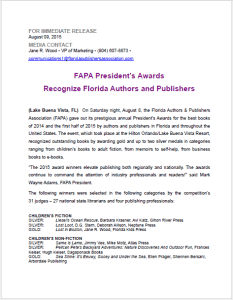 I am pleased to share the results of the Florida Authors and Publishers Association’s President’s Book Awards for 2015 for multiple reasons. The president in question is my friend and colleague, Mark Wayne Adams, and handing out these awards was his last official duty before stepping down as president. In addition, one of the books honored with this award is my book, The Plan that Launched a Thousand Books, which received two silver medals. While attending the awards ceremony, I was also able to meet someone I’ve known online for years, Bette Lee Crosby, whose latest book was also receiving an award. All in all, it was a great event, and the awards were well-worth attending! Tara R. Alemany is a best-selling author and speaker. Her books include "The Plan that Launched a Thousand Books," "The Character-Based Leader," "My Love to You Always," "Celebrating 365 Days of Gratitude," and her latest title "The Best is Yet to Come." In her spare time, Tara is a recognized thought leader who runs Aleweb Social Marketing, does her best to raise her two teenagers, and serves on two Boards of Directors. She is also Chaplain of her local Word Weavers chapter, and is a black belt in Tang Soo Do.